Let’s face it: planning a wedding is no walk in the park. Sure, it’s exciting and inspiring to check out all the details, dresses, jewelry, exotic locations and honeymoon destinations. But there is a lot to do and everyone and their mother (and your mother) seems to have an opinion about your day. 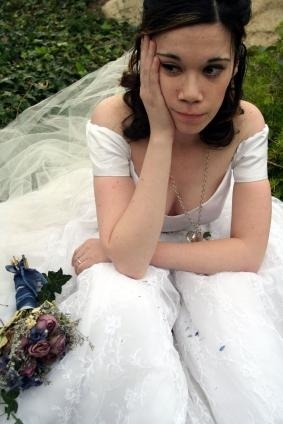 If you don’t watch out for these common mistakes, you could end up with a wedding day nightmare: a party where no one dances, wedding vendors who don’t show up, even guests who cause a scene. On the other hand, as long as you watch out for these mistakes, having an unforgettable wedding day where everything runs smoothly and you actually get to have fun is almost guaranteed. WARNING: Make these mistakes at your own risk! Mistake #1 – Setting the Date FIRST.The first thing many couples do when they get engaged, after they stop jumping up and down with excitement and screaming it from the rooftops, is set the date. It’s kind of like deciding what town you want to move to before you even visit, or before you check out the weather and job situation. You end up accidentally choosing the most popular time of the year in your area. You can’t afford your dream location and the best wedding vendors and services are already booked up, so you have to settle for the leftovers. You don’t have the flexibility to take advantage of the deals that come up which could have allowed you to afford your dream location. Your wedding date may fall on a religious holiday or other unpopular day that means many of your friends and family can’t come. You might unknowingly pick a date during your town’s annual Lima Bean Festival and find out that all the hotel rooms are booked up and your out of town guests have no where to stay. Of course, you want to set the date as soon as you can. Even if it’s just so that you have something to answer your nosy friends when they ask! But it’s vitally important to figure out how much money you have to spend, what parts of the wedding are most important to you and to do your homework FIRST. That way you’ll avoid a world of pain. Get the other 5 mistakes and a lot more wedding tips by signing up below. You can read or listen to the episodes on your iphone or mobile phone if your short on time.